Strangely enough, I have found that the older I get (and the closer to death I suppose), the more fascinated I become with bodies, bones, and pathology. I am obsessed with skeletons and I harbor a secret dream of discovering a dead body (thank you Forensic Files and CSI!). Much of this can be explained by my love of the past, due to the incredible amount of information that bodies and their remains can teach us about past lives and long-dead civilizations. Mostly these are just bones...but not always. There are some bodies, literally thousands of years old, which magically survive to us with skin, organs, stomach contents, bruises, and even moustaches still intact. These are the bog bodies, and Miranda Aldhouse-Green is brilliant in her assessment and analysis of them in Bog Bodies Uncovered. A bog is formed from dying plants falling into a body of water. The lack of oxygen in the lake prevents full decomposition, so the vegetation in the water remains in a half-rotted state. Aldhouse-Green tells us that it is not only these anaerobic conditions that encourage preservation of organic materials, but also certain bog mosses that have bacterial properties which aid in preservation. But vegetation is not the only organic material to survive in these unique bog environments: Scientists and peat cutters over the last century have found weapons, cauldrons, textiles.....AND HUMAN BODIES! 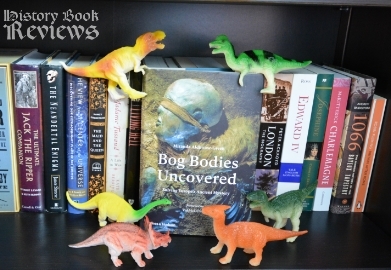 Bog Bodies Uncovered is a systematic study of these bodies and what they can tell us about life and death in past millennia. The structure of this book is phenomenal, and is laid out in an exceptionally clear way in the introduction. Aldhouse-Green examines the Who, Where, How, and Why of this fascinating mystery, of the humans who were deliberately killed and placed in bogs thousands of years ago. 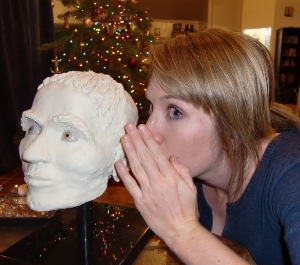 She bases her study on the specifics of about 25 bog bodies, which she describes as only a fraction of the total bog body population (some written sources put the total number at 1,850, others at less than 100). In this confusion lies my only suggestion for making this book better: I wish the author had given more statistics. If we don't know exactly how many bodies have been found in the past (many have dissolved due to poor 19th century preservation techniques), how many are still extant today? What percentage of these are male vs. female? Give me some hard data for comparison! 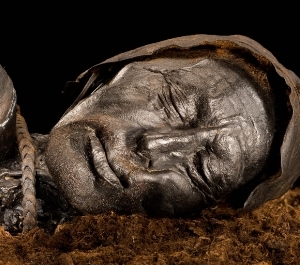 Tollund Man, probably the best preserved of all bog bodies. Approximately 2,500 years old, you can still see his beard and wrinkles, as well as the rope that bound his neck. Yet this book is thrilling beyond words. In these bog bodies we are given the opportunity to gaze into the faces of Iron Age and Neolithic people, our distant ancestors. We can tell what kinds of hairstyles they wore (and if they had lice), what they ate for their last meal, how well or poorly nourished they were and, most intriguingly, how they were killed. Many had choking ligatures, stab wounds, broken bones, and throats slit so deeply that the head was nearly severed. Aldhouse-Green tells us the evidence points to what she calls "over-killing", with perhaps a large group of people beating and inflicting wounds on the victim at the same time. In many cases the rope binding the victim's hands is still present. In every study and debate on the bog bodies, one cannot avoid one's thoughts turning to ritual sacrifice or execution. This is a huge no-no in the archaeological community, which wants to avoid labelling anything in the past as "ritual" just because we don't understand it today. However, these people certainly did not die of natural causes. Aldhouse-Green give three and only three possibilities of what happened to these people: Accidents, execution, or murder. Believe it or not, the 'accident' theory actually has some supporters, which I find a little hard to swallow. "Oops, I accidentally fell into the middle of this bog and got sharpened wooden stakes impaled throughout my body, anchoring me underneath the water!" "Oh, clumsy me, I accidentally slit my throat while shaving and cut both my carotid artery and jugular vein!" Yeah, not so much. Fascinatingly, Aldhouse-Green reveals that in the community of bog bodies there is a vast overrepresentation of people with physical abnormalities or disfigurements. One had severe scoliosis, one had a diseased hip which would have affected walking, one was a dwarf, one was hugely tall, one had a deformed ear, one had an extra thumb...I would love to see the statistics on this across ALL bog bodies, not just the ones selected by the author. In the distant past these physical abnormalities may have been viewed as really really bad or really extra good, and in either case could have made these people more likely to be selected for ritual (gasp!! Bad Jennie!) killings or offerings. Of course we can never fully grasp the mindset or culture of people so long ago, but this is a rather exciting basis for speculation. Another area where Bog Bodies Uncovered excels is in its discussion of the ethical dilemma surrounding the bog bodies. Should they be disinterred at all? Is it insensitive to display them in museums? Should they be subjected to medical and forensic testing? Is all this a violation of their rights and what they (presumably) wanted for themselves after death? This was riveting to me, and I couldn't stop thinking about it, trying to figure out where I stand on the matter. I finally decided that I believe the bodies are just shells---vessels, actually, that hold information and snapshots of the past. They are full of wonder and fascination to living people, able to teach us so much about our history, but no longer useful to the deceased because their soul has moved on and is no longer attached to their body. They should be afforded respect and humanity as much as possible, both as once-living humans and because they give us a truly unique opportunity to come face to face with our past. Especially when Caroline Wilkinson (I KNEW she would show up again, I love her!!) 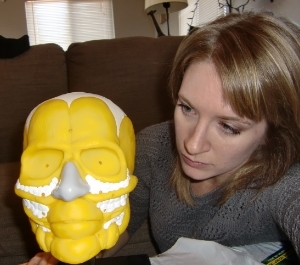 uses her gift for forensic facial reconstruction and lets us see them as they might have looked while alive! Thank you, Bog Bodies, for the gift of knowledge that your death and your bodies have given us. Thank you for your ignominious end, which has in a way made you immortal, and which has allowed science to resurrect you. 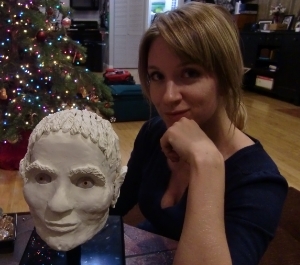 And finally, thank you for teaching me that humans used hair gel over 2,000 years ago. 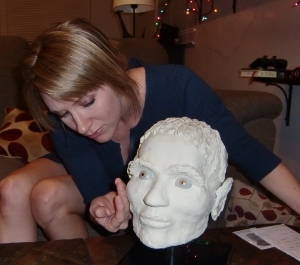 Photographic evidence of my first attempt at forensic facial reconstruction, a la Caroline Wilkinson!